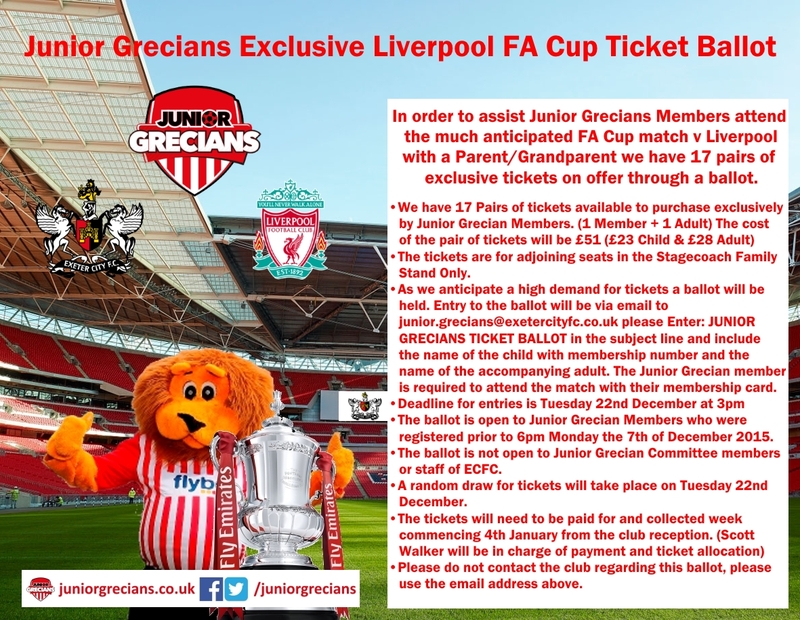 I wish to clarify the situation regarding your Junior Grecians Membership and the Liverpool FA Cup game. 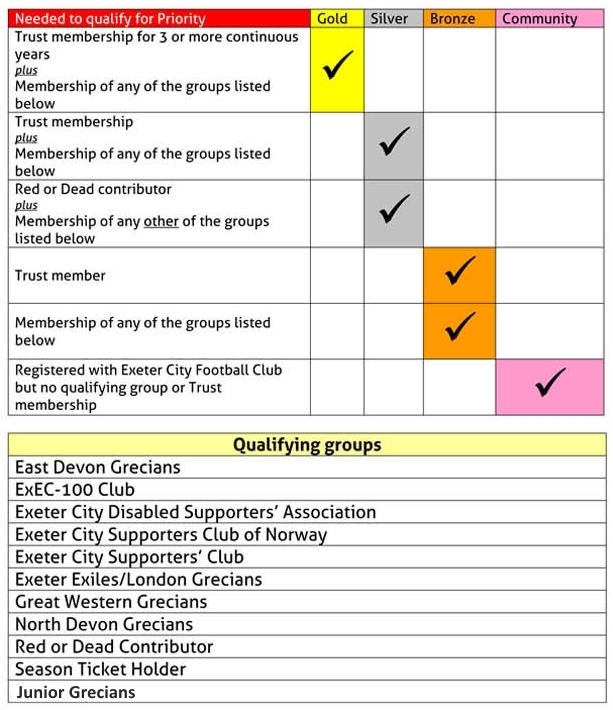 ECFC Priority Status rules are clear that the SILVER status your child holds as a Junior Grecian/Trust Member gives entitlement for only one U/18 ticket for this game. However, as the previous email informed you, I have managed to persuade the Club Board to allow special arrangements for 17 pairs of tickets to be made available to Junior Grecians accompanied by an adult. These pairs of tickets will be allocated through a ballot of entries on 22nd December. If you have already bought your child a ticket and are lucky in the draw, you will be able to purchase a pair of tickets for the Stagecoach Family Stand. If you would like a refund on your original ticket, it must be returned to Club Reception before Tuesday 29th December. • 17 Pairs of tickets will be available to purchase exclusively by Junior Grecian Members. (1 Member + 1 Adult); the cost of the pair of tickets will be £51 (£23 Child & £28 Adult). • The tickets are for adjoining seats in the Stagecoach Family Stand Only. • Entry to the ballot will be via email to junior.grecians@exetercityfc.co.uk please enter: JUNIOR GRECIANS TICKET BALLOT in the subject line and include the name of the child with membership number and the name of the accompanying adult. The Junior Grecian member is required to attend the match with their membership card. • Deadline for entries is Tuesday 22nd December at 3pm. The draw will take place shortly after that time. Lucky Junior Grecians winners will be notified by phone call that evening to arrange payment and collection of tickets. • The ballot is open to Junior Grecian Members who were registered prior to 6pm Monday 7th of December 2015. • Please do not contact the club regarding this ballot, please use the email address above. In future, in order to ensure that you are able to purchase tickets at the same time as your ‘Junior Grecian’, in the event of ‘restricted ticket’ game, recognising that he or she will hold SILVER Priority Status, it is advised that you consider joining ‘The Trust’ plus one other Group providing parity with them.